When an environmental dispute in South Lake Tahoe turns murderous, uneasy residents aren’t the only ones howling for the killer to be collared. A nosey basset hound named Cruiser does some howling of his own when he sniffs out the mutilated remains of a Tallis Corporation CEO on a hiking trail near Cave Rock. 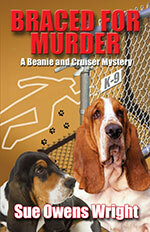 Cruiser and his Native American owner, Elsie “Beanie” MacBean, soon find themselves up to their ears in a homicide investigation. Sacred to the Washoe Indians, Cave Rock is Tallis’ proposed construction site for a fabulous indoor rock climbing playground and casino, which promises to boost South Tahoe’s sagging economy. However, someone, or something, will stop at nothing, not even murder, to stonewall the Cave Rock project. 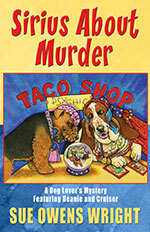 As the body count climbs, Sheriff Skip Cassidy enlists Beanie’s help (and Cruiser’s, of course) in digging up clues to the culprit’s identity. Mystifying evidence leads Beanie to make some rather unorthodox conclusions about the case, which leads Skip and her daughter, Nona, to believe she’s completely flipped her beanie. When Death comes prowling at her door and Nona vanishes without a trace, it’s up to Beanie and her slobbery sleuthhound to track down their deadly quarry before Tahoe goes to the dogs. 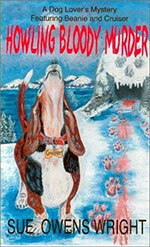 Someone in South Lake Tahoe is Sirius about murder, and dog owners and their pets are about to discover that the killer’s bite is much worse than his bark. 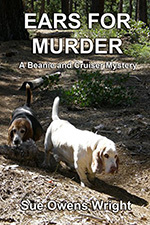 Elsie MacBean (Beanie) and her Basset Hound, Cruiser, find themselves dewlap-deep in a murder investigation when supporters of a controversial dog park, proposed for a coveted tract of Tahoe shoreline, are earmarked for death. The fur starts to fly at a Howloween fund-raiser for Alpine Paws Park when Abigail Haversham, heiress to the lakeside property, is discovered strangled near the Psychic Paws booth after her quarrel with Madame Pawline, a pet psychic with a bone to pick. Mounting evidence implicates the pet psychic in Abigail’s murder, but Beanie and Cruiser are also hot on the trail of other quarry in the Sirius killings. When Tahoe’s dog fanciers pack together at spooky old Haversham House for the Halloween Bark in the Park costume ball, will the vicious killer seize this opportunity to unleash his revenge on them? The hunters become the hunted when Sirius comes sniffing after Beanie and Cruiser. Only Beanie’s unbreakable bond with Cruiser can nip this crime spree before they become the next victims of the Sirius Killer. Fasten your life vests for an E Ticket Tahoe cruise when you embark on murder with Beanie and Cruiser. 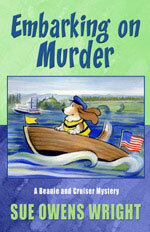 Some people really go overboard for their anniversary, especially spoiled young Ivy Diggs, who mysteriously vanishes during the Dixie Queen paddle wheeler’s crowded Fourth of July dinner cruise on Lake Tahoe. 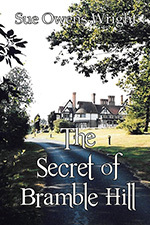 It’s also Elsie MacBean’s 50th birthday celebration, which almost turns out to be her last when Beanie finds herself embarking not only on a calamitous cruise but a murder investigation. After overhearing Ivy’s angry outburst at her husband moments before her disappearance, Beanie suspects Ivy’s drowning may not have been accidental, as is assumed. In Beanie’s estimation, anyone who was present at the Diggs’ anniversary party could be a possible crime suspect… and even some who weren’t. While casting for clues amid purported sightings of a legendary creature believed to inhabit the lake, Beanie and her sleuthhound Cruiser discover something more sinister is lurking beneath the surface of this mystery surrounding the Lake of the Sky. Ivy Diggs isn’t the only one to end up in deep water as Beanie also becomes the target of a killer. Trouble crops up in Native American Elsie “Beanie” MacBean’s neck of the woods during Lake Tahoe’s worst drought of the century. Beanie already has her hands full, dog sitting Calamity, her daughter Nona’s rescued basset hound, and is feeling overwhelmed, dealing with her crazy new boarder’s behavioral issues and chronic ear infections, while juggling writing deadlines and caring for her own dog, Cruiser. While on a woodland hike with Cruiser and Calamity, Beanie lets the dogs off their leashes. As the two canines rush off, she questions the wisdom of letting them run free. But when the dogs start baying, she knows they’ve found trouble. Sure enough, the animals have sniffed out a lumberjack’s corpse, hugging a tree, with an arrow piercing his neck.